Great things were in store for Moses. His life had been a roller coaster always teetering between life and death. He began life fleeing from Egyptian executioners, found himself among royalty and then became a fleeing felon from the household of Pharaoh. Now, in Midian, he had the unexciting job of herding sheep for his father-in-law. God spoke to Moses from the bush that didn’t burn. He gave him the most improbable and surprising command of all: go back to Egypt and free my people. In Exodus 3, Moses offered every possible excuse to avoid returning to Egypt. He was afraid of Pharaoh and the fate that awaited him there. God would not take excuses then as he does not now. Instead he told Moses that he would be with him and would give him the tools he needed to accomplish his mission (Exodus 3:10 4:17). 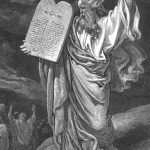 There comes a point where Moses’ hesitancy incurs God’s wrath. “The anger of the Lord burned against Moses” (Exodus 4:14). God simply will not take excuses. You know the rest of the story and you know the great a mighty success brought by God. Is there some God-appointed mission in your life that you are delaying? Are you fearful of what the future may hold? God took no excuses from Moses and will take none from us. On the other hand, he will be with us and give us all the tools necessary to accomplish his will. Will you rise up today and do what the Lord has asked?